Welcome to the Midwest’s newest, premier setting for the arts and design industry. The Carmel Arts & Design District has attracted well over 100 businesses including art galleries, antique dealers, furniture and interior design showrooms, restaurants, boutiques, creative service providers, and an eclectic variety of specialty retail stores. And the list of merchants continues to grow. Residents and visitors enjoy a vibrant oasis of fun and inspiration. Townhouses and condominiums share the stimulating, artistic atmosphere with retail storefronts and professional office suites. With immediate access to the Monon Trail, bricked sidewalks, public sculptures and proximity to nearby cultural amenities, the Arts & Design District provides a truly unique experience. Please visit the other pages of this site to learn more about what’s happening and what’s to come! 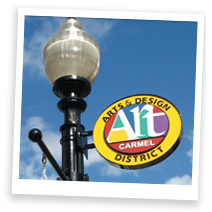 The Arts & Design District represents the beginning of a true renaissance in Carmel, Indiana. It will evolve into an educational resource, where visitors can take advantage of lecture series and classes by artists and designers on upcoming trends in art and design, hosted by district businesses. In close proximity, there will be a variety of activity centers and amenities including the state-of-the-art Performing Arts Center and the CityCenter development. Recreational destinations within a short drive, or bicycle ride, include a beautiful grouping of Parks with entertainment and sports-related venues. If you would like to receive information about the latest developments and upcoming events in the District, click on "Join the Mailing List" located in the right column of this page. 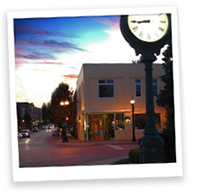 Thank you for visiting the Carmel Arts & Design District website; we hope you can stay awhile and come back soon.